The Winter Modul II took place from February 4th to February 22nd, 2019. 1 CH = 45 min. The result of the placement test on the first day of the course determines the language level of your German course. The test result is valid regardless of the German course you have registered for. Requirement for the A1.2 course: A1.1 graduates with at least 50 CH - no absolute beginners! On the first day of the German course there will be a mandatory placement test for all participants! 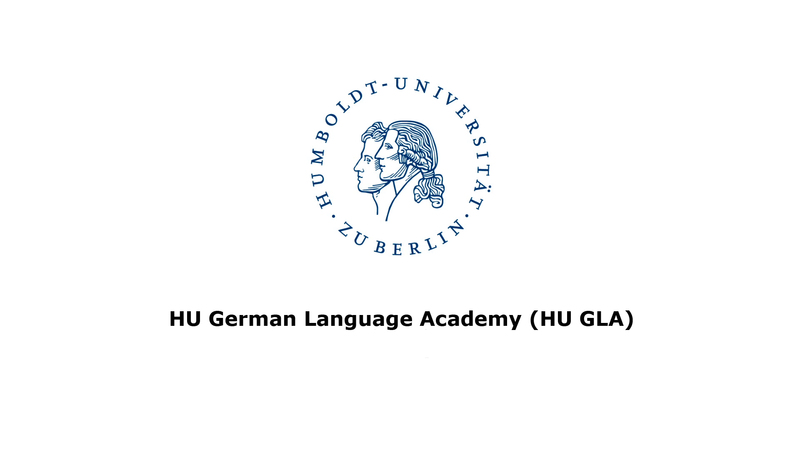 The HU GLA German courses, the placement test and the awarding of certificates are strictly based on the classification of language levels according to the Common European Framework of Reference for Languages. These specifications may differ from those of other countries. The fee for sending the original visa invitation letter via courier is 30 EUR for Europe/60 EUR outside Europe. A visa invitation letter sent by e-mail or fax is free of charge. For the German course: In case of a cancellation before the course starts and after payment/transfer of the course fee to the Humboldt-Universität zu Berlin a fee of 100 EUR does apply! If you cancel after the beginning of the course or during the course participation, we must retain the full course fee. Please note that all bank charges are to be paid by the applicant! Please inform yourself about the amount of the fees for a bank transfer to Germany at your bank! Be sure to take out health insurance for the duration of the course. This must be valid for Germany (preferably for Europe). We also strongly recommend that you take out accident and liability insurance. Otherwise, you are liable for all culpably caused damage. Within three weeks after the registration, the full course fee must be paid. If the payment is not credited to our account within this period, we have to cancel your registration. Your registration for the course can only be definitively confirmed once the course fee has been received in full! Important note for reference: Please indicate the reference number, the chosen course, the module and your name! You are responsible for your visa application! Usually a tourist visa is sufficient for our 4-week German courses. Please inform yourself at the German Embassy in your home country about the entry and residence regulations. We offer to send you an official invitation to support your application at the German Embassy. We can send an official invitation by email free of charge or by courier (subject to charge). The invitation is only valid for the duration of the course! Invitations will be sent only after the payment of the course fee has been received. The German Academic Exchange Service (DAAD) offers scholarships for the HU GLA courses during the summer period. Please apply for a scholarship directly with the DAAD. The application period ends approx. 6-8 months before the beginning of the courses. The DAAD awards scholarships independently of the Humboldt-Universität zu Berlin. Therefore, we can not help you with your application. For all DAAD scholarship holders, a place in the HU GLA program and an apartment spot is reserved. Inform yourself about our course offer on our web pages. Please note that the booking of an apartment spot is binding. In case of cancellation the full apartment fee does apply. 1. Reading: You have received a scholarship confirmation and further documents from the DAAD. Please read these carefully! 2. Online registration: Register immediately for your HU GLA German course online. 3. Select: You can optionally request an apartment spot and a Visa invitation. This can result in additional costs! Your scholarship/travel expenses will be transferred directly to the Humboldt-Universität zu Berlin by the DAAD. Any remaining amounts will be paid out to you in cash by the HU GLA. The total fee consists of the course fee of 850 EUR and the apartment fee of 450 EUR (optional). The amount of your scholarship will be determined by the DAAD. The scholarship usually includes 950 EUR + individual travel expenses. If the total fee after the registration with the HU GLA program is higher than your DAAD scholarship, you have to pay the remaining costs yourself! We will inform you by e-mail about your remaining charges! Be sure to take out health insurance for the duration of the course. This must be valid for Germany (preferably for Europe). We also strongly recommend that you take out accident and liability insurance. Otherwise, you are liable for all culpably caused damage, in particular in the accommodation offered by the HU GLA. 1. The participants of the HU German Language Academy (HU GLA) behave fairly. In particular, they respect the right of free expression of instructors and other participants. 2. You assume responsibility for your own learning and prepare yourself beforehand with examination and study regulations. Your examination and learning tasks are provided independently and on time, using only permitted aids in this context. 3. Participants assume responsibility for problems that might appear during their studies or courses. In conflict situations, they are supposed to react appropriately and to contribute to constructive and solidary solutions. 4. They treat each other respectfully. This includes being attentive, focusing on, and actively participating in the courses. Therefore, the use of cell phones and smartphones should be limited during the courses to the necessary. 5. The participants of the HU GLA appear on time for the courses. If you opt for a room or an apartment, please make sure that a written contract is filed and signed by both sides! Always pay attention to the seriousness of offers: never transfer any money in advance! For more safety information about housing in Berlin (in German). Please note that you need to be officially enrolled as a student at the Humboldt-Universität zu Berlin in order to be allowed to live in the student dorms provided by Studentenwerk. The Humboldt-Universität zu Berlin distances itself explicitly from the linked sites and is not responsible for the content, accuracy and completeness of external websites.